The Spadina Streetcar has operated now for just over a decade. For all the problems of getting the project approved and built, there is no question that it has transformed travel on Spadina. With such intensive scheduled service and a complete right-of-way, we should have the best possible quality. This series of posts will examine the actual service in December 2006. The presence of a right of way greatly reduces the sort of variation seen over the course of the day on mixed-traffic routes, but does not eliminate it completely. As demand rises and falls, stop service times vary and this affects trip times. Although the averages are well-behaved, the degree of variation is quite substantial. Indeed, given the short distances travelled, the amount of variation is comparable to that seen on the much longer mixed-traffic Queen route. This variation undermines the benefit of the right-of-way. Some delays due to traffic signals are visible in the data, but the resolution of the TTC’s monitoring system (CIS) is such that I cannot report on this in detail. Short-turning is a chronic problem at Queen’s Quay, and much of the service destined for Union Station never actually gets there. At first sight, I was reminded of Queen Street in the Beach when I reviewed the charts. This is no recommendation for the benefits of exclusive right-of-way. Spadina is a route that demands management by headway, not by schedule. With extremely frequent service, the concept of being “on time” is meaningless to riders. For those awaiting a review of a suburban bus route, please have patience. With all the discussions of service reliability on Queen, I thought it important to look at a route operating completely on reserved lanes to see just how it behaved. For those who are new to this blog, I recommend reviewing the early posts about the King car in the Service Analysis category. The techniques used to distill the TTC’s data and present it for analysis are explained there in detail. First up is the chart showing service for Christmas Day, 2006. The short-turn service to King sits in the top half of the charts. Union Station is at the bottom, and the route via Queen’s Quay gets much less service than the heavily used Spadina segment. Horizontal lines visible at Queen Street are carhouse trips. I have plotted all locations to and from both carhouses at this co-ordinate so that they are visible, but the lines do not interfere with the regular service trips. Horizontal jogs in lines are visible at several locations. These are places where cars sat for long enough that CIS reported them twice, at least, in the same place. Although we might put this down to stop dwell time, the locations and times of day suggest that this is more likely due to interference by the so-called transit priority traffic signals. There are problems with resolution of vehicle movements at King. CIS “sees” a car passing the signpost at Queen and, based on the distance travelled, plots it south to King (not via Adelaide to Charlotte). At this point, the schedule says that the trip is supposed to go north, and CIS plots a northbound movement getting as far back as Queen Street. However, the car actually went around the block via Charlotte Street and eventually arrives at the King & Spadina signpost. CIS then corrects the car’s position. This type of error makes the data northbound from King to Queen meaningless because of the many phantom trips. Another CIS error shows up with Union Station trips that short-turn at Queen’s Quay. CIS thinks the car is still eastbound on Queen’s Quay until information from the electronic signposts corrects this, and CIS puts the car back where it should be on a northbound trip. This doesn’t appear on Christmas because short turns were rare, but we will see a lot of it on charts for weekdays. Departure times at Spadina Station are rarely clear. Instead, a car arrives at the loop, and then appears to take a leisurely trip to the surface where its location is picked up again in the data. Times a Union are unreliable in a different way. There is a signpost just before the portal on Queen’s Quay, and we get data for cars entering and leaving the tunnel. However, there is no layover at Union visible because, I suspect, the data for this trip is synthesized. Anyone who rides the 510 knows that cars take long layovers at Union, but this is not directly observable in the data. Despite these limitations, we can still get a fair picture of how the line behaves. One important point about the chart from Christmas (and other quiet days) is that we see a fairly reliable service to Union Station. When I first reviewed the charts for weekdays, I thought that some problem with CIS must have prevented proper monitoring of trips into the tunnel. However, the fact that the data is well behaved on days when we would not expect much short turning shows that the problem lies with service management, not with the data. As we have seen on other routes, headways may average what the schedule says they are, but there is some variation in actual operations. The headways shown at Spadina Station are suspect because we don’t have reliable departure data. These values are more likely to represent variations in arrival times. The headways at Harbord are much more tightly grouped around the average and lie within a band of roughly 2 minutes either way. The very short headways in the evening are cars running in to the carhouse that follow immediately behind an in-service car. As we move south on Spadina, the headways start to spread out and by Dundas we see a range of 3 minutes either way. This falls within the TTC’s performance standards for “on time” service. North of King, the data includes trips that have actually gone via the Charlotte Street loop (see discussion of CIS plotting errors above). South of King, the average headway widens, but the spread in values stays mainly within the +/-3 minute standard. This starts to widen out as the service progresses east on Queen’s Quay. Arrival times at Union are, as I mentioned earlier, probably calculated from other data and represent the headway at surface locations. Times leaving Union show a fair amount of scatter, just as we saw at Spadina Station, but this is reduced once we reach a surface reference point at York. Even so, headways can reach close to 10 minutes on a holiday service with no source of interruption. This is probably due to variations in dwell times at Union Loop. Once we are north of King, the short turn service cuts in and the average headway goes down. The effect of the “ghost” trips from short turns described earlier can be seen by comparing the charts for south and north of Queen. South of Queen, the ghost trips are present, while north of Queen they are not. The valid headway information northbound on Spadina from King actually starts with the “North of Queen” chart. Headways from Queen north stay within a six minute band, although they are slightly more dispersed once we get past Dundas Street probably due to variation in dwell time at the northbound stop. Compared with previous route analyses, I have defined more “time points” for Spadina in an attempt to capture the dwell times at traffic signals. The result of this is not yet conclusive, and I need to dig into the raw data to understand what is happening at each location. I have not presented detailed link by link charts here yet for this reason, although some idea of the granularity I am attempting is visible from the number of different locations in the headway charts discussed above. However, we can look at the link times over substantial parts of the route to see how well-behaved they are on Christmas Day. For both northbound and southbound trips, the time from North of Harbord to South of Queen holds a steady average of 8-9 minutes with a small rise northbound later in the day. Note, however, that the times are scattered in a band about 5 minutes wide. On a base of less than 10, this is a considerable variation. Similarly, for trips between east of York to south of Queen, the trip times average around 10 minutes, but there is a spread of 5 minutes or more. We will see more scatter in the data when we turn to the all-month charts in a later post. At the terminals, as we have seen on other routes, there are resolution problems that preclude accurate reporting of dwell times. However, we can look at the round trip times to a nearby point where the data is reliable and infer from this the variation in station times at the terminals. The round trip from York to Union consistently averages about 7 minutes on Christmas Day, although there is a spread of about 6 minutes around the average. Similarly, at Spadina Station the round trip from Harbord averages 6-7 minutes within a band of about 6 minutes. The situation on the southern part of the route is even less reliable than on the northern part. I cannot help concluding that the variation arises primarily from traffic signal delays, and will explore this in a future post. The NIMBYs didn’t want a right-of-way similar to the Queensway, with its open track. Understandable because of the cosmetic look. Instead they got cobblestones, so that emergency vehicles and such could use it. Steve: Actually, it’s not the NIMBYs, it’s the TTC and the roads people who want vehicles to be able to drive on the right-of-way. The “cobblestones” are fakes — they have a large form that is pressed into the concrete to make it look vaguely like cobblestones. If they are too “bumpy”, they will make life difficult for ploughs. However, all the snow that we got this past winter seems to provide the negative aspect to it. Plows must be used to clear the snow from the right-of-way. Otherwise the streetcars get bogged down. Unlike the Queensway, in which the snow is left as is and the streetcar provide the plowing of a sort. The height of the track provide extra clearance. Only if the accumulation is so high, are the plows sent out to clear the Queensway right-of-way. How many times have the emergency vehicles used the Spadina right-of-way, anyways? Are our winters the reason that grass can’t be used as a compromise? Steve: I’ve seen the odd police car and ambulance on Spadina and Queen’s Quay where there are no pesky centre poles in the way. The problem with grass is that it’s high maintenance, and one hour of bus traffic will destroy months of landscaping work. Also, it’s very hard to plough snow if there’s a good chance you will also rip up the roadbed. I really enjoy your analysis, however, do you feel that continually using Christmas Day as a “best-behaved conditions” day is appropriate? 2. Lack of any riders on the route on Christmas Day. Loading and unloading passengers on the route probably impacts how the route runs throughout the day. Any thoughts? Or I am just being crazy! Keep up the excellent analysis! Steve: The reason for using Christmas in 2006 is that it was a day with very light road traffic and passenger demand, as well as no foul weather. This filters out a lot of external issues that might interfere with readers’ ability to see the general patterns. This also becomes a good base point from which to view data for other “normal” days. For example, on Christmas, almost all of the service ran to the advertised destination. This is most definitely not the case on regular weekdays. Also, the little “steps” in the service chart where cars sit at intersections are almost certainly due to traffic signal delay, not to long dwell times, because the loading was fairly light. When these steps show up in regular weekday, we know that they are a chronic problem of the route independent of congestion or loading. In the analysis of 501 Queen and 504 King, something that showed up immediately was the extremely long layovers at terminals because cars didn’t need all of their running time. Notwithstanding this, the cars managed to leave the terminals on a ragged headway, and pairs of cars bunched together as they moved across the city. This is not a question of “taking it easy”, but of dedication to service quality even if the cars are only half full. Good to see an analysis of the 510. I use this car regularly, and while I find the service to be generally reliable, I’m often bewildered as to how the headways can become so irregular. My completely unscientific observations suggest that the line is a victim of its own success; that overcrowding lengthens dwell times at the busier stops, and ‘trains’ of cars develop just outside the intersection waiting for the lead car to clear the farside stop. To maintain headways, it’d be great if the TTC would enact a policy of ‘overshooting’ the platform if cars catch up behind -the lead car would still unload passengers within the platform proper, but leave enough room for the car behind to load passengers in the hopes of restoring regular headways. Of course, such a policy would require that TTC riders don’t board the first car they see… it boggles my mind as to how riders will slow the line down packing themselves like sardines into overcrowded cars when there’s an half-empty one just behind. Other than that, put couplers back on the CLRVs and run MUs! 1) Not only is it time-consuming to make those turns at Spadina & King/Adelaide, it also contributes towards congestion along King which slows down the 504. 2) With the new highrises sprouting up by the Skydome, I wager that the TTC will earn loyal riders once residents see streetcars pouring by their balconies every 2-3 minutes -we’re talking thousands of potential fares, where’s the foresight? Do you think it’s an option that the TC lines will run on standard roadbed (i.e. ties & ballast). There are major advantages to this over the concrete encasement. Steve: It would be nice if they did this, but I’m sure that because it’s a road, and we all know that roads have to be paved … well you can see where I am heading. And I can hear the lawyers now claiming that if we leave the tracks open, jaywalkers will trip on them and sue the TTC for every last token. One reason for delays is that passengers continue to exit using the front doors. Why? It is the same reason that when the MU’s were running on Queen or Bloor, the front car gets filled before the rear car’s seats are even filled. On Yonge, the Peter Witt train’s trailer had more seats available than the front motor car. Even if the car or bus stop is a far-side stop, passengers continue to exit through the front doors. It leads to delays. The same can be said with the low-floor buses. Even if they don’t have baby strollers, they continue to use the front doors. I’ll bet that when the new light-rail vehicles are running, with all-door boarding, passengers will continue to fill the seats nearest the driver. Steve: One important difference with the rear door of low-floor buses is that you have to push the door open, whereas at the front, the operator opens it for you. Also, the rear door of buses is often not as close to the curb as the front door, and in bad weather, there is more likely to be snow and slush to deal with at the rear door. All of this sends people who are worried about getting off safely to the front door. The problem that causes at least 95% of delays is the traffic lights. Due to the complete absence of signal priority (except at a few minor intersections), streetcars regularly spend a long time waiting for traffic lights – a problem exacerbated by the far-side stops at most intersections, and the left-turn cycle for cars which precedes the green light. In many other systems, streetcars have such effective signal priority that they almost never stop at traffic lights – why can’t the TTC study what they are doing and copy them? Also, there seems to be insufficient evening service on the line. Late evening service on Friday and Saturday nights is totally insufficient given the number of bars and nightclubs near Queen & Spadina; I have regularly seen overcrowded streetcars then, since they only run every 7 minutes on weeknights and 7 minutes 20 seconds on Saturday nights. The TTC needs to schedule Friday evening service separately from Monday-Thursday service because evening demand is much higher on Friday nights than on weeknights, especially downtown. Personally, I think that overnight service is justified on Spadina on Friday-Saturday night given how much activity I have observed there at 2:30am. Steve: I have heard claims in the past few months that “something will be done” this year with the signals because the TTC and the road folks are on better terms now. Needless to say, I will believe it when I actually see it. Is there any possibility of some parts of TC lines being run to one side of the adjacent street? 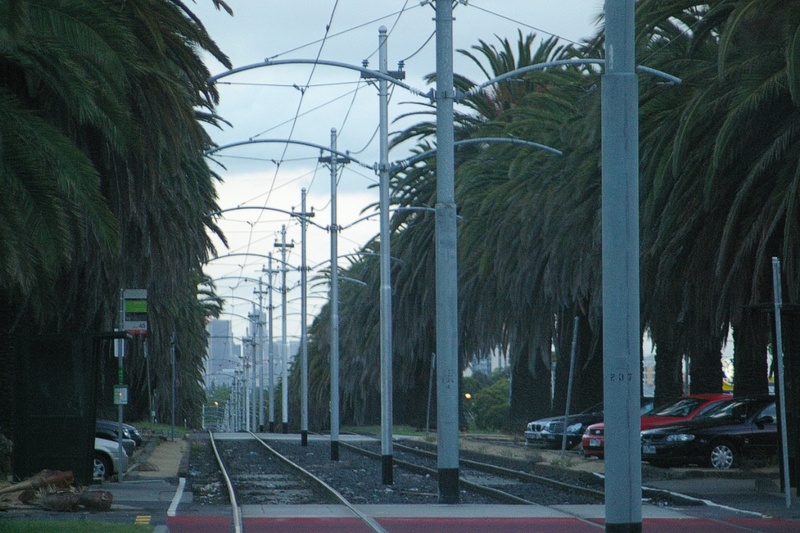 In places where there are no, or very few driveways and not too many side streets, this can be achieved with railway-type crossings (interlocked with no-right- and no-left-turn signals) giving the LRVs priority. An example of this is on Hiawatha Avenue in Minneapolis (see about half way down http://lrt.daxack.ca/Minneapolis/index.html). I can see Sheppard Avenue east of Markham Road being a candidate for this, along with Morningside north of Sheppard (if and when the line would be built that far north) In fact, for a number of years, CPR had a spur that ran parallel to Morningside from Littles to Old Finch, so the space is there. While I completely agree with Marc C that it would be better for passengers – especially the thousands who will be moving into City Place if the loop at Charlotte were used only for “emergencies” and that most 510 cars went, at least, to the loop at Queen’s Quay – this would also allow all the 510 cars to intersect with the line proposed for Bremner Blvd – BUT access to the QQ loop means the cars need to deal with the eastbound turn at QQ and, as you, Steve, have pointed out elsewhere, the signal priority at this intersection is very odd. Once they have turned east on QQ they then need to turn across the westbound lane of QQ to get into the loop. As the QQ track is going to be rebuilt in 2010/11 I wonder if it would work better if the QQ loop were ‘reversed’ so that southbound Spadina cars enter it just north of QQ, go through and make two right turns to get back onto Spadina to return north. Steve: Major changes will be needed to the signals in this area because, especially southbound on Spadina at Lake Shore, the holds are interminable. If the King trippers all went to Queen’s Quay, they would be backed up onto the bridge waiting for the traffic light. If we reverse the loop, then the left turn into the loop would be made across exactly the spot where a queue of northbound cars would be waiting for the light to proceed. On the headway now operated to Charlotte, I think this conflict would be unworkable. This intersection is probably the most flagrant example of transit non-priority on the route. 2 Calvin: Thanks a lot for the info on Hiawatha line. Some intersections had the walk signal on all four directions, but usually it’s with the straight arrow. I think at least that the signal priority on Spadina should allow the streetcars through before the left turn arrow, and then followed by the left turn arrow and then the regular green light. If there is no streetcar, then go ahead with the left turn arrow. The current traffic light setup is wrong. Are the current traffic people afraid to experiment? They experimented with the crosswalk system in the 1950’s and have altered it over the years. Why not experiment with the traffic light setup? Do they still have to get permission from the Ontario government before touching any traffic light? Steve: The traffic folks predict gridlock on cross streets if we mess with the timings for Spadina, and any “unusual” signal behaviour is claimed to cause tons of accidents because motorists see what they expect to see, not what the signals actually do. This doesn’t quite square with the locations where the behaviour of advance greens varies by time of day and day of the week, but usually they only need one excuse at a time. I agree. Experiment. Prove that an alternate scheme won’t work, don’t just be a scaremonger. I second Mark C. on reducing the use of the Charlotte Loop. Since there wasn’t likely much use of that on Christmas Day it wouldn’t show in your analysis it wouldn’t appear to an issue. My anecdotal observation is that during rush hour Spadina cars are delayed getting onto King St. and Spadina Ave. by traffic. The delayed Spadina cars impact the w/b King cars causing the King car to bunch up behind at the intersection. The stop at Spadina was briefly relocated to Charlotte and King during sidewalk construction at the new condo on the N/E corner. King cars could hold traffic for the Spadina cars to turn onto King St. I’m by no means advocating another stop as it only aided in getting the car onto King. The Spadina car still had to coerce it’s way onto Spadina. Down at Queens Quay the traffic is considerably lighter most of the time than it is north of the Gardiner. A thought on “curbside” running especially given our recent weather. Without a physical separation between the road and tracks snow would be plowed right onto the right-of-way. Much like many of the sidewalks. At least with MOR ROW’s the plows are moving the bulk of the snow away from the tracks. I don’t believe Melbourne has to consider snow in their ROW alignment. Another impediment to curbside running could be turns on red lights. Restricting them might be an issue, since I am of the belief that there is anarchy on the streets as far as traffic laws are concerned. Regardless either ROW’s could be fenced in less built up areas especially ones without the Spadina culture of jaywalking. A problem most of the Queensway avoids as the Gardiner is on the south side of the road. Mark C.: it boggles my mind as to how riders will slow the line down packing themselves like sardines into overcrowded cars when there’s an half-empty one just behind. W.K. Lis: One reason for delays is that passengers continue to exit using the front doors. Why? This drives me mental. One day I SWEAR I am making a T-shirt that says “Please exit by the rear doors, or I will be forced to smite you.” Using the nice black-on-yellow script look of the stickers in the streetcars, naturally. Steve: Be careful while smiting the heathens at the front door that you don’t get caught on candid camera! If someone takes to long take their left turn, you can always install a camera which will take a snap shot of their license plate and make them pay ;). That is how it is on most LRT systems. 36th Ave NE in Calgary operates much in the same way. I know that 36th Ave can get congested on the Weekends, but I believe that has more to do with a lack of Transit on the Weekends combined with a much to narrow street. If one of the two were improved it wouldn’t be as much of a problem. On the Weekdays it is much better because transit is usually quite good. I like standard roadbed suggestion. I don’t think this would work in Downtown, most systems seem to be content with a system which has a shell. But could this be a possibility for the suburban lines? I think the Queen Car already uses it. Steve: Of course the Queen car already uses it on The Queensway and has since the 50s when this right-of-way was created. As for the traffic lights, the problem with your scheme is that when the headway around than two minutes (daytime, seven days a week), there is almost always a streetcar in one direction or the other, and people would wait a very long time for a left turn cycle. In the run-down of a trip, I mention that it takes approximately 36 minutes to go from one end to the other. That would make the average speed 32 km/h, including stop time at stations. The downtown section is the slowest, with the LRT taking about six minutes to travel from the end of the line to the Downtown East/Metrodome station, which is only about 2km. The next couple of stops cut across expressways for another 2-3 km and provide a better way through the area than any bus route does. Then the line parallels Hiawatha Ave for about 6 km with stations about a mile apart (1.6 km). Hiawatha Ave is a bit of a non-grade separated expressway (Highway 2a or 27 in Toronto come closest to describing it). It has no bus route right on it, but a route that serves the northern and southern LRT stations on the line runs down a parallel road that serves the destinations on its east side exists. With the exception of one stop on Hiawatha Avenue, all the stops are served by several local bus routes (on average 4-5 routes each). Further south, the line has some 2 km stretches between stations that serve a military base and the airport, so it provides a direct route into that area that is far better than any road can. South of the airport, the longest stretch runs down the median of another road much like Hiawatha, then the stations are closer together from there to the Mall of America. Steve: This is a good example both of the flexibility of LRT in running in numerous environments, but also of the fact that there is no one definition or standard for the type of service it can provide. Where stops are widely spaced, speeds are high. Where they are close together, they’re not. Looking at this in the SRT context, regardless of the technology, the 2km runs from Kennedy to Lawrence and then Ellesmere allow trains to run at high speed for significant distances and this pulls up the average speed of the line. During the am peak, the scheduled speed is 36.6 km/h; at other times it is 34.9. The reason for this is that the AM peak schedule uses a 21 minute round trip time (RTT) compared with a 22 minute RTT otherwise. If there were stations at the midpoints between the stations on the north-south leg, the RTT would go up by about 25% assuming a roughly 5 minute increase due to 4 additional station stops, and scheduled speed would drop to about 28km/h. If the stop spacing fell below 1km, we would start to see the effect of not running at top speed for much of the trip, and the impact of more stops would be proportionately more severe. This is the same debate as others have raised here about station spacing on the Transit City routes. If the RT is extended on a completely segregated right-of-way with only a few stations, then it should be able to maintain its average speed over the extended section. This does not prevent a less exclusive right-of-way for outer parts of the line where speeds would be lower due to stop spacing and/or traffic interference at intersections. As someone who used to live near Spadina as the ROW was being built and who now lives on the west side of the new St Clair ROW, I’d like to add something about the ROWs that I haven’t heard discussed much. U-Turns. Pre-ROW Spadina between King and College was rife with illegal and dangerous u-turns. In the early 90s, my travel on Spadina as a transit user was seriously hampered on at least 2 occasions by accidents caused by u-turns. Surprisingly, some drivers were making these turns for some time after the ROW had been built; however, the 2000 curb upgrades stopped that. Less illegal u-turns made it safer for pedestrians, cyclists, transit users and drivers. St Clair West, especially between Vaughan and Caledonia, is another area where people make frequent dangerous illegal u-turns. In the last 3 years, on St Clair West, I have witnessed the aftermath of at least 3 accidents involving u-turns gone wrong that have stopped transit. One was a car that had u-turned into the path of streetcar! I have seen a few cars and many bicycles doing illegal u-turns and turns on the new ROW leg west of Avenue. It has likely been less frequent due to the fairly high curb. Maybe they will learn not to do it as drivers of Spadina have. I certainly am hopeful that fewer illegal u-turns will be the norm once the ROW is completed. Steve said: I’ve seen the odd police car and ambulance on Spadina and Queen’s Quay where there are no pesky centre poles in the way. The problem with grass is that it’s high maintenance, and one hour of bus traffic will destroy months of landscaping work. Also, it’s very hard to plough snow if there’s a good chance you will also rip up the roadbed. I just wanted to add that with the amount of salt we dump onto roadways, the soil would be dead for the next spring. Even on a right-of-way there are drivers who seem to like hitting up on an LRT or streetcar. Steve: This kind of behaviour shows precisely the reason why access to the Spadina right of way was changed and St. Clair’s strongly discourages incursions. Motorists are terminally thick sometimes — they are in a “left lane” and expect to be able to turn at any opening. Further to mike b’s comments on U-turns: Not only does the presence of an isolated ROW prevent illegal U-turns, but it often involves the installation of signal-controlled LEGAL U-turns. Thus, safety related to U-turns is enhanced. Also. on the CLRVs, it’s hard to get past standees in the main aisle – so people take the path of least resistance. If people really need to see green on a ROW – use FieldTurf 🙂 We have dug up the grass at our house in favour of annual and perennial plants and mulch, and it’s dispiriting to see the amount of water wasted with hose sprayers in our neighbourhood for grass that turns yellow and infested with crabgrass anyway. As for the notion that people drive what they expect rather than with adherence to signals – I don’t recall that being part of the Driver’s Handbook. The only way that is going to change is with education by means of object lessons. I note in Dublin the number of reports of vehicle vs LRV collisions has decreased markedly compared to the rash at service inception, but I expect that when the lines are extended there will be a similar spate before people in the new areas get the message that an LRV should be treated with the same deference as an 18-wheeler as it has the same capacity to squash your car. Yes, I’ve seen a U-turn or two in front of a streetcar in my day. I’m not so sure if there’s anything short of a brick wall that would keep some drivers from cutting off a streetcar. My dad, a family friend and I were eating in a restaurant in Brussels one time and were treated to a scene of a car being driven on a raised right of way! Houston, Texas has sure seen more than it’s fair share of car-light rail accidents since it’s present line went into service. Then there’s the occasional ignoramus who doesn’t stop behind the rear doors. One time years ago we were riding east on the Dundas line and witnessed a guy pulling that next to the car we were on and our operator got out and gave that guy some serious hell about it. Anyone who thinks that operator wasn’t mad is crazy.